A few shovel loads later, the farmer finally looked down the well. He was astonished at what he saw. With each shovel of dirt that hit his back, the donkey was doing something amazing. He would shake it off and take a step up.As the farmer’s neighbors continued to shovel dirt on top of the animal, he would shake it off and take a step up. 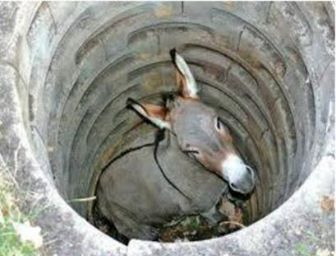 Pretty soon, everyone was amazed as the donkey stepped up over the edge of the well and happily trotted off! Lovely story and messages. Thank you for sharing.